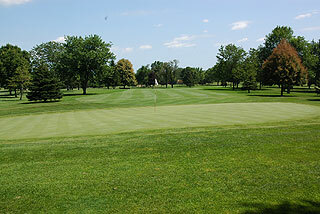 Palatine hills Golf Course is located in Palatine, about an hour drive northwest of Downtown Chicago. 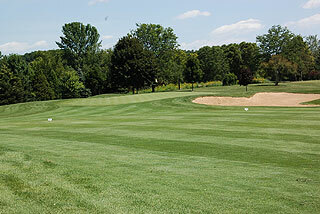 The par 72, 18-hole layout was designed by E. Lawrence Packard in 1965. A friendly staff, nice course conditions, and affordable rates provide an enjoyable experience for golfers of any skill level. There are some decent discounts such as the resident special-every Tuesday until 1:30 pm - all golfers pay resident rates. The property includes a nicely stocked pro shop, practice facility, and a separate clubhouse with a snack bar serving breakfast, lunch, and dinner items, and a patio deck with a view of the golf course. 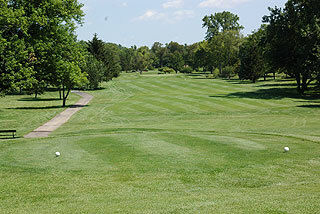 The clubhouse is limited in size and is not known for hosting many outings, but Palatine Hills does have a fish fry every Friday during the season. 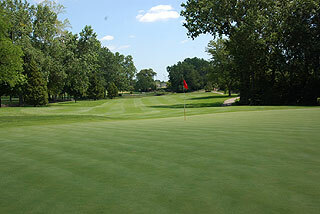 Practice facilities feature a targeted grass range, putting green, and a short game area with sand bunker, and lessons are available. The course is well marked as sprinkler heads provide yardages measured to the center of the green. During our visit the staff was also experimenting with yardage disks on some fairways and stakes on others at the 200, 150, and 100 yard mark on par fours and fives. Color coded flags provide pin placement information on each green - red for front, white for middle, and gold flags indicate a back of green hole location. Four sets of tee boxes play to distances and slopes measuring 6800 yards/127 slope, 6533 yards/124 slope, 6170 yards/120 men's slope and 129 women's slope, and 5450 yards with a slope of 112 for men and 121 for women playing from the forward tees. Bunkering is understated leaving recovery room from inaccurate tee and approach shots. 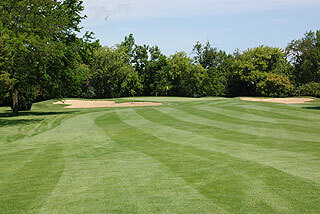 There are only seventeen sand traps situated near landing zones and greenside. 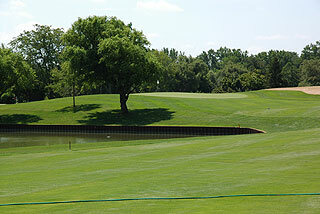 Streams and ponds must be carried or avoided frequently as water features come into play on nine holes. The terrain is sloping with large hills and valleys that extend across the fairways providing challenging up hill and down hill lies. The fairways are tree lined but mostly open with room for recovery. 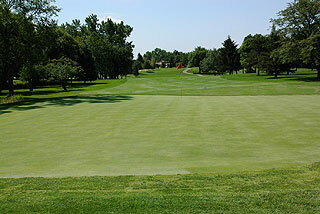 The ground near the putting surfaces is flat providing bump and run opportunities and easy approach shots. 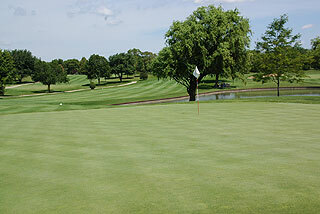 The small to medium sized greens are pretty fast with mild undulation and are kept in good condition. For more information please visit our page for the course with a direct link to the Palatine Hills website by clicking here.